Bemersyde is an 18th and 19th century mansion built around a 16th century tower house, and was home to Field Marshal Sir Douglas Haig. 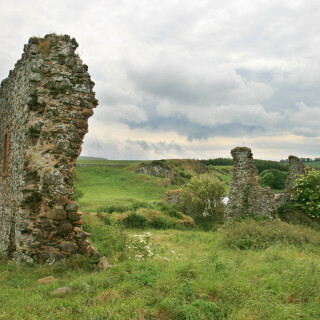 The lands of Bemersyde have been in the Haig family since at least the second half of the 12th century and probably earlier. Petrus or Peter de Haga is mentioned in a charter of 1162 as the owner of the lands and barony of “Bemersyd”, while a charter which probably dates to 1183 refers to his mother Goda having previously owned the house of Bemersyde. The family were probably of Norman origin. The family motto of the Haigs is “Tyde what may”, derived from a 13th-century prophetic poem by Thomas the Rhymer (of Rhymer’s Tower) which stated that the Haigs would always reside at Bemerdyde. 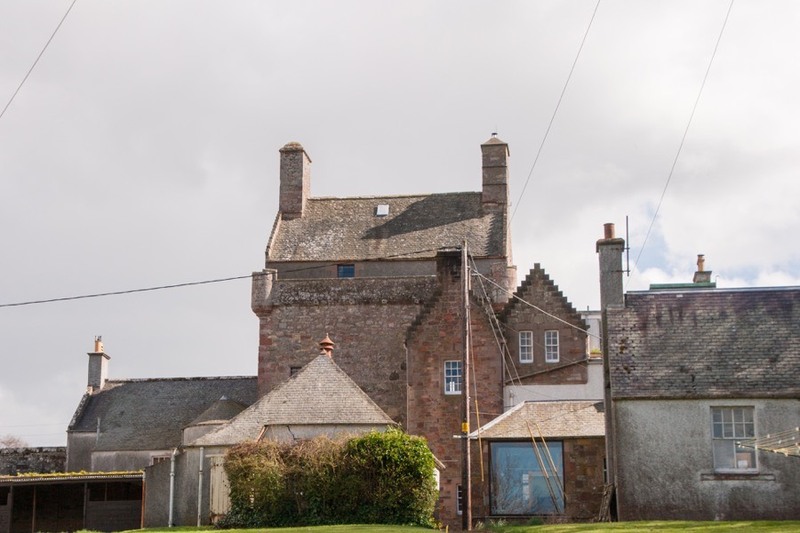 The tower house is said to have been built around 1535, although it almost certainly incorporates the fabric of an earlier castle. It stands on rising ground set back from a bend in the River Tweed which protects the estate on the north, west and south sides. 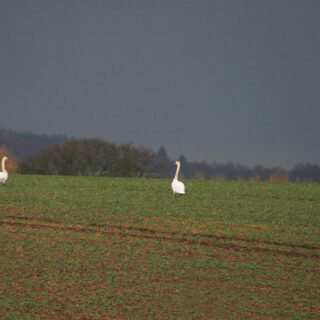 Protection to the east would have been offered by the marshy land of Bemersyde Moss. 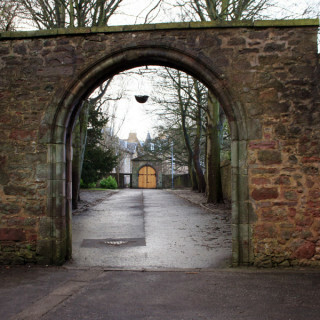 The earlier castle may have been built to protect the nearby Monks’ Ford which was on the route between Old Melrose Abbey and Dryburgh Abbey. 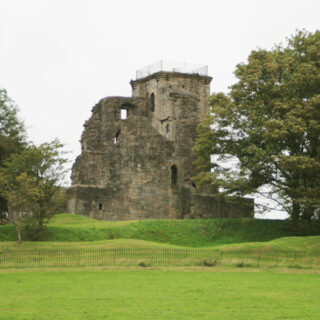 Measuring around 11.0m approximately east-northeast to west-southwest by around 8.4m north-northwest to south-southeast, the tower rises to a height of 12.0m at the top of the parapet. A high vault curves over the two lower storeys, with an entresol between. There are two further storeys above the vault, comprising of a main hall and an attic. The main entrance, which was later enlarged, is an arched doorway slightly east of the centre of the south side. A spiral staircase within the thickness of the wall at the south-east corner affords access to the entresol and main hall, with a timber staircase rising to the two upper floors. The walls are some 3.0m in thickness. The main hall is on the second floor and has a fireplace and window at the west end, two windows to the south (the westernmost one has an aumbry within the embrasure), one to the north with a seat and one to the east. The east window features a long, narrow embrasure off which are accessed a small intramural chamber with fireplace, aumbry and window to the north and a small garde-robe to the south. Above the hall was the Red Room, named for the colour of its wall hangings, which contained the principal bedroom. On the fourth floor was a watch house, with roofed with large flagstones, originally surrounded by a parapet walk with corbelled-out rounds at each corner. In 1544 Robert Haig, the 14th laird of Bemersyde, captured an English commander, Lord Evers, at the Battle of Ancrum Moor. The wounded prisoner was taken back to Bemersyde where he died a few days later and was buried at Melrose Abbey. The following year Bemersyde was burnt by the Earl of Hertford. 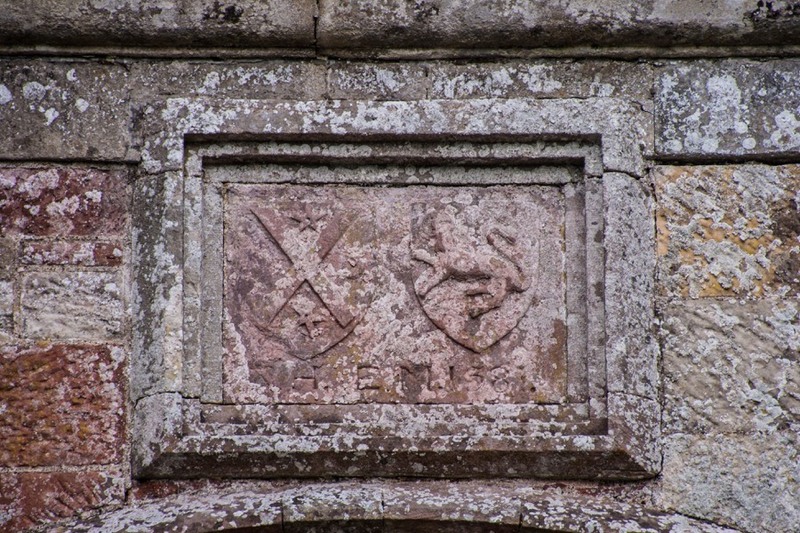 It was remodelled in 1581, at which time a stone carrying the initials and arms of Andrew Haig and his third wife, Elizabeth McDougall of Makerstoun, was carved. This stone is now installed above an archway to the east of the east wing leading through to the stables courtyard. 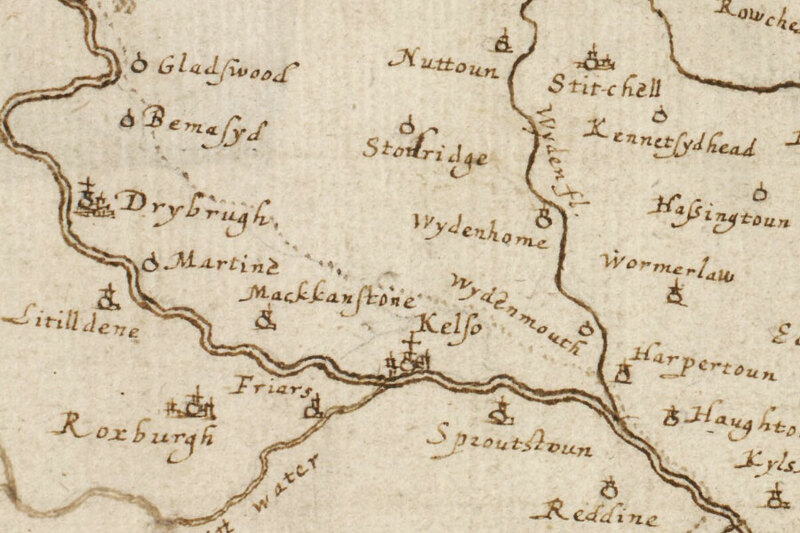 Late in the 16th and early in the 17th century the family seem to have found themselves in some financial difficulty as Robert Haig, 16th laird of Bemersyde and son of Andrew and his second wife Susan Renton of Billie, mortgaged their properties of Over and Nether Mains of Bemersyde to George Haliburton of Dryburgh in exchange for a loan of 1800 merks. Following Robert’s death in 1602 his eldest son, James, succeeded as the 17th laird. He married Elizabeth McDougall of Stodrig and they had ten children including eight sons. James seemingly mismanaged the family’s financial affairs and in 1610 temporarily transferred the estates to his brother William, a successful lawyer, in exchange for a loan. In 1613 the transfer seems to have become permanent, but in 1619 William transferred the estates to his nephew, James’ eldest son Andrew. However Andrew died young in 1627, and with his eldest brother, Robert, residing at Throsk, several other brothers having entered military service in Holland and some presumably considered too young to succeed, their uncle William took on Bemersyde once more. 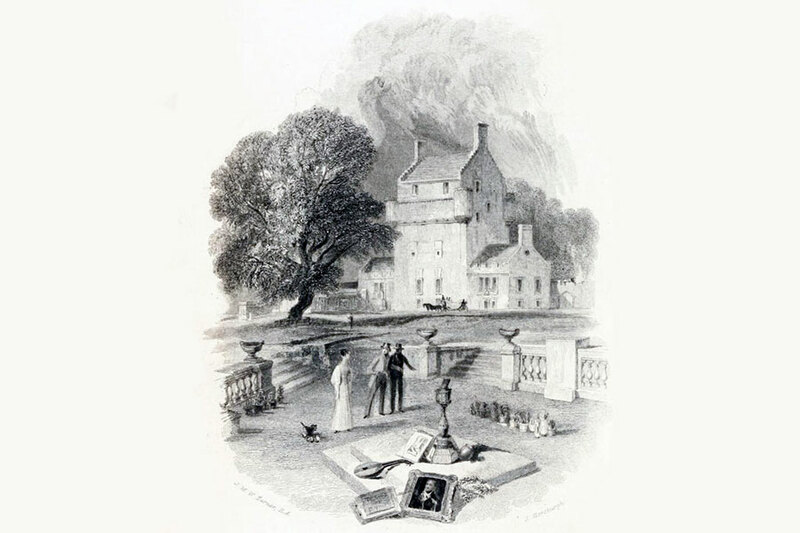 William later moved to Holland, and arranged for his sister, Margaret, to take up residence at Bemersyde with her husband James Haliburton of Dryburgh. In 1635, when one of the brothers, David, was around twenty-five years old, William transferred Bemersyde to him, making David the 20th laird. David was also living in Holland at the time, and the following year married Hibernia Scholes or de Scale, a granddaughter of the Earl of Hohenzollern. 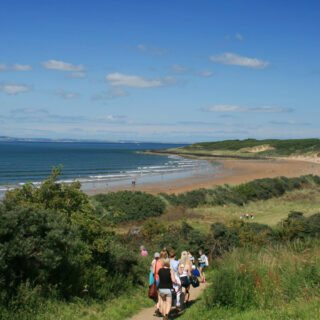 He visited Scotland in 1637 and sold the lands that had been mortgaged to the Haliburtons by his grandfather to his cousin, Thomas, the son of his aunt Margaret Haig and James Haliburton. 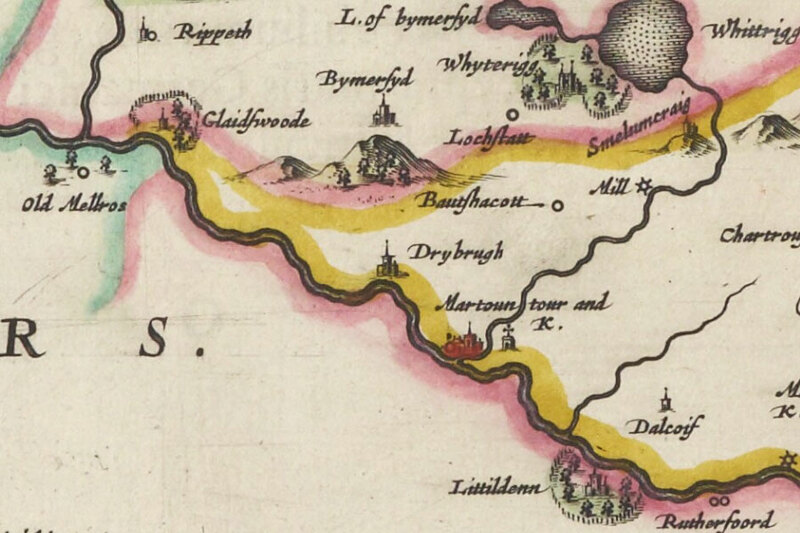 In the mid-17th century Bemersyde appears on Gordon’s map as “Bemasyd” and on Blaeu’s map as “Bymersyd”. 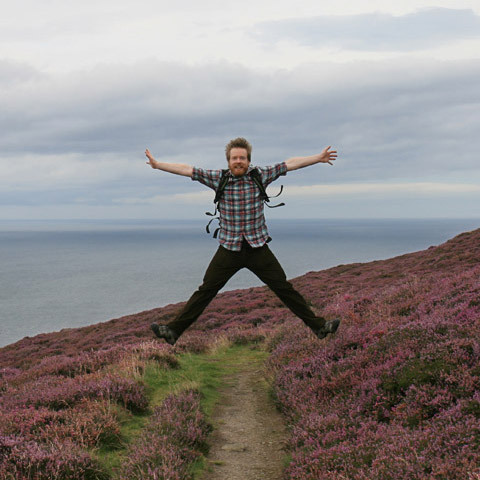 David remained in Holland until 1646 when he returned to Scotland. 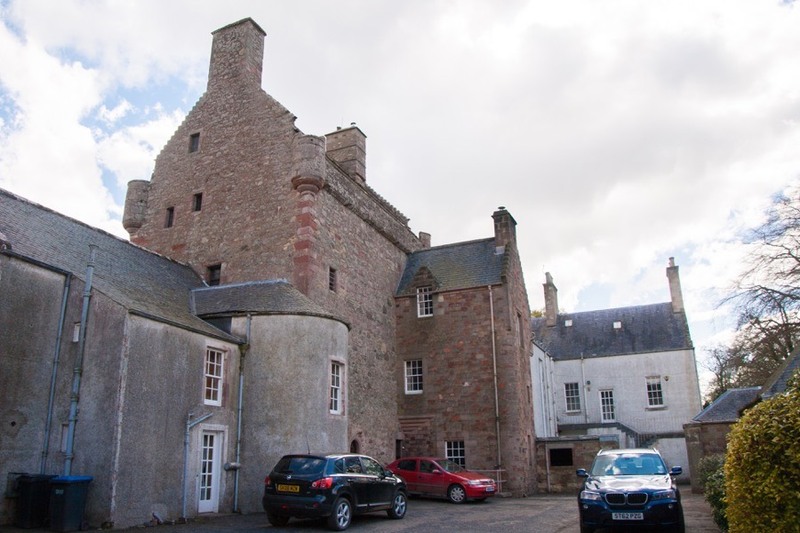 With Bemersyde occupied by the Haliburtons, David and his family moved into the old tower of Thrid at the north-east corner of the Bemersyde estate. David was succeeded by his eldest son, Anthony, in 1654, against the backdrop of the religious Wars of the Three Kingdoms. 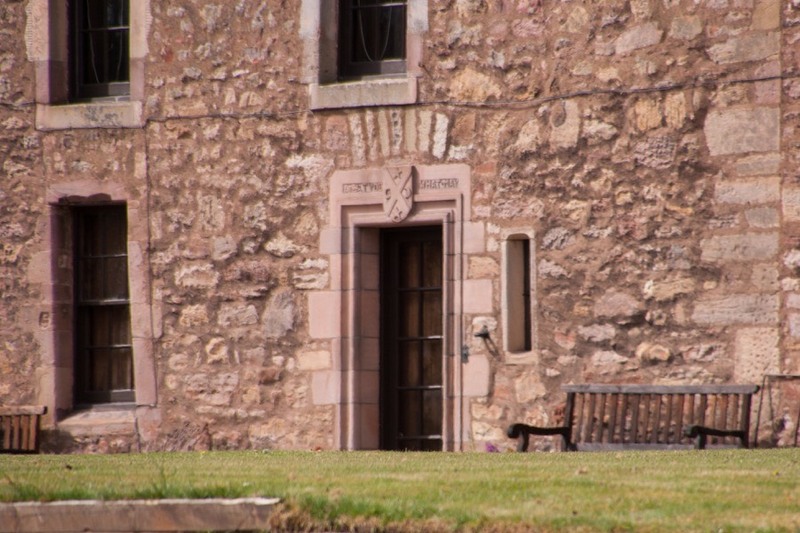 Anthony became a Quaker in 1657 and following the Restoration he was imprisoned in 1663 for his religious beliefs in the Tolbooth in Edinburgh and latterly in Edinburgh Castle. 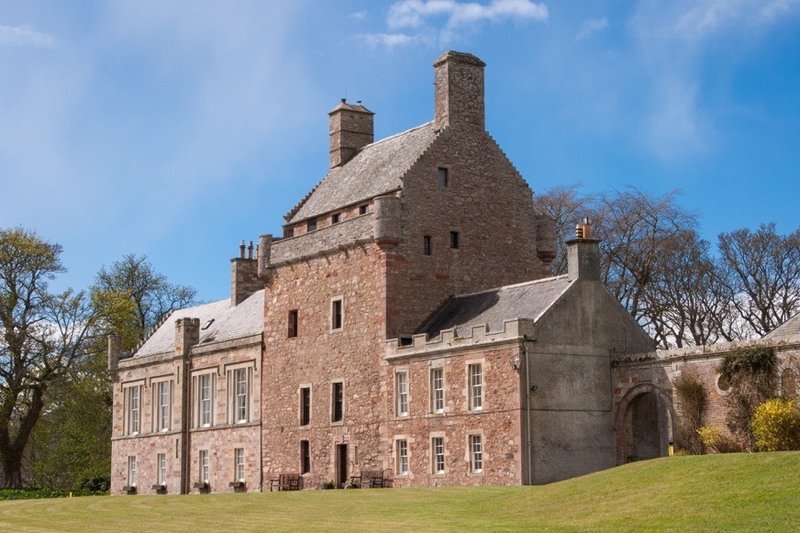 He spent four years and four months in prison and was finally released in December 1667, returning to live at Thrid which he remodelled in 1672. In 1680 Anthony paid off his debts to the Haliburton family and moved his family into Bemersyde, dedicating himself to the improvement of his estate. He was responsible for extending the attic watch house east and west to the edges of the tower in 1690 with crow-stepped gables, removing the parapet walk on those sides, and re-roofing the new structure with slate. He also installed in the garden a magnificent sundial with sixteen faces dated the same year. 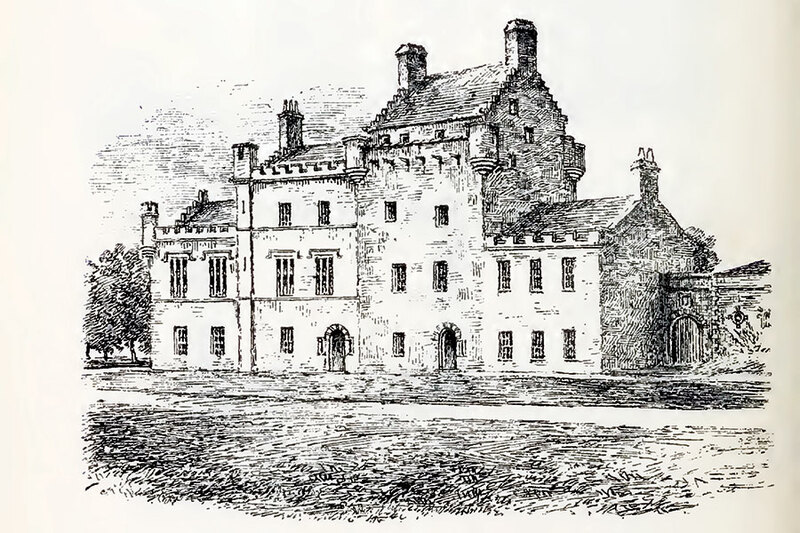 Anthony kept a record of his improvements and refers to removing stables and byres from the south side of the tower, suggesting perhaps that there was originally a barmkin, and rebuilding them to the north. In 1761 James Haig extended the tower to the west with the addition of a new two storey wing. A matching east wing was added by James Zerubabel Haig in 1796. JMW Turner drew a view of Bemersyde in 1831 showing the two 18th century wings, a version of which was published in a book of 1881. In 1854 the male line of the Haigs failed when James Haig, the 25th laird, died with no heir, leaving the estate to his three sisters. Bemersyde was leased to Charles Baillie, Lord Jerviswood, during whose tenancy James Haig’s west wing was rebuilt as a three storey extension by the architects Peddie & Kinnear in 1860. Two single storey stable blocks, the south range of which features a central pediment, built to the east of the main house may also date from this period, as may a pair of crow-stepped gable extensions to the rear of the tower. In 1866 the sisters signed a deed transferring the succession to a distant cousin, Colonel Arthur Balfour Haig, from the Clackmannan branch of the family, who were descended from Robert Haig, the second son of the 17th laird, James Haig. When the last sister, Sophia, died unmarried in 1878 Bemersyde passed to Colonel Haig, who became the 28th laird. A drawing from 1892 shows the three storey west wing with a further two storey extension to the west. Whether or not these two height sections were built at the same time in 1860 is unclear. After World War I Colonel Haig put Bemersyde up for sale, and a public subscription in recognition of Field Marshal Haig’s service raised the funds required to buy the estate for him. He had been made 1st Earl Haig, Viscount Dawick and Baron Haig of Bemersyde in 1919. Subsequently the viscountcy of Dawick was used as a courtesy title for the heir to the earldom. 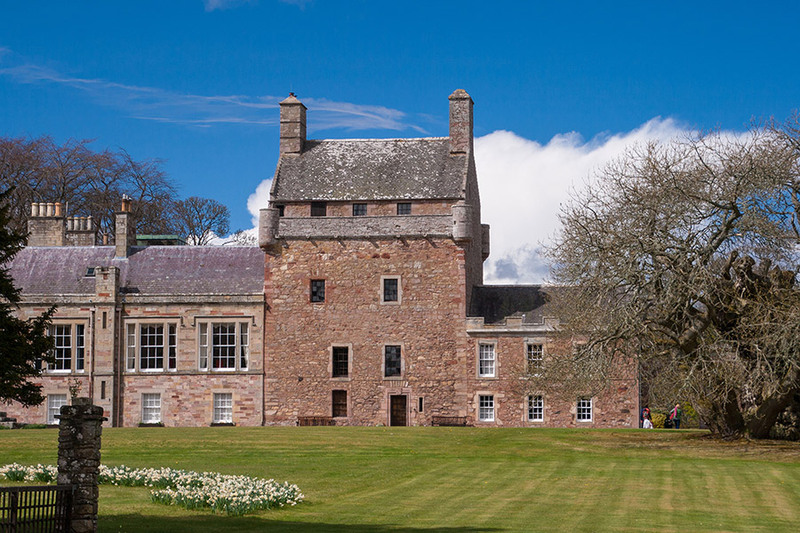 Alterations were carried out in 1923 for the 1st Earl by the architects Alison & Hobkirk, including raising the north range of the stables to two storeys. 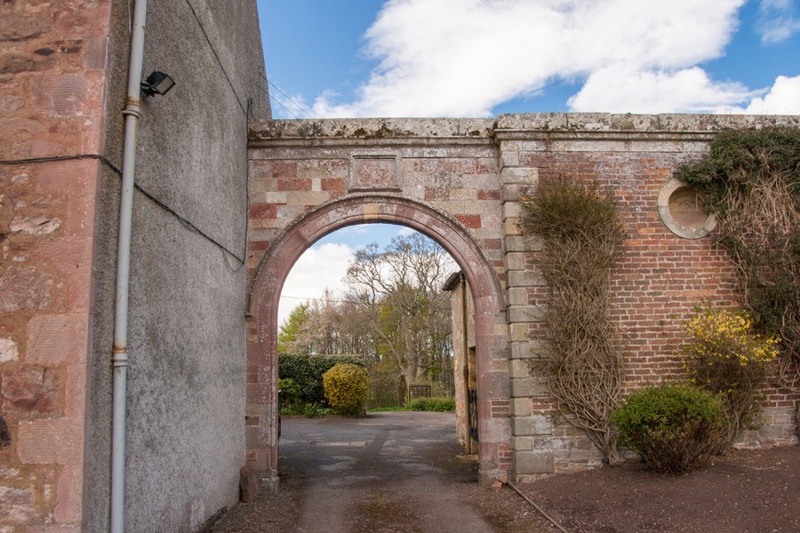 It is likely that the old arched doorway was enlarged and remodelled at this time. The 1st Earl died in 1928 and Bemersyde passed to his son George Haig, 2nd Earl Haig. 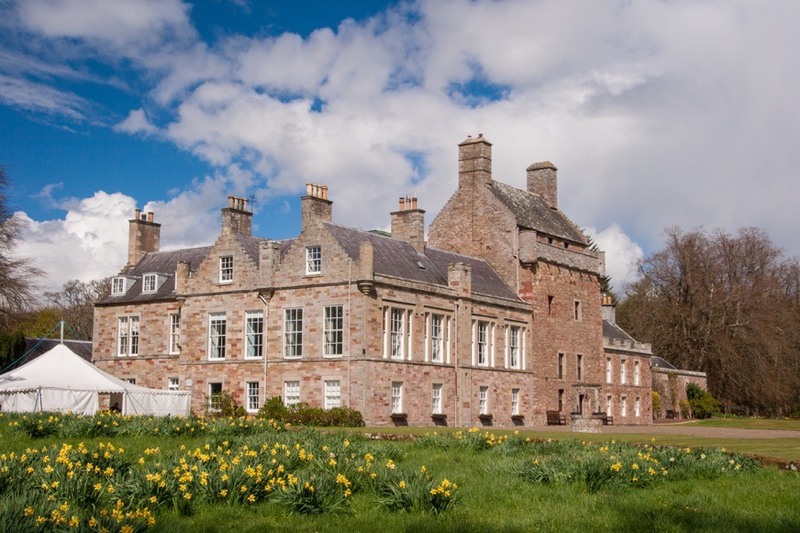 Bemersyde was occupied by the Edinburgh Asylum for the Blind and the Women’s Land Army during World War II, with the 2nd Earl returning to live at Bemersyde in 1947. Between 1959 and 1961 the west wing was reduced to a height of two storeys by the architect Ian G Lindsay, but remains longer and larger than its 18th century predecessor. 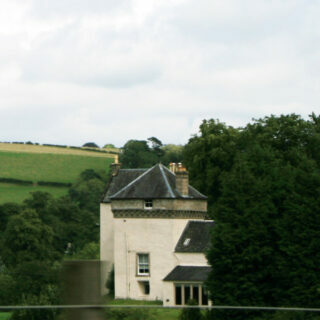 Bemersyde is the seat of the chief of Clan Haig and the private home of the current chief Alexander Haig, 3rd Earl Haig. Bemersyde is the seat of Clan Haig. Bemersyde is in the parish of Mertoun and the county of Berwickshire. Published on the 21st of May 2011 at 12:00 am. Updated on the 1st of November 2016 at 11:15 pm.